Now you can assign product to the manufacturer without entering the same data again and again. After extension activation you will get new menu under products. There is where you will manage all manufacutrers. Manufacturers catalog can be displayed automatically on selected page or anywhere on the website with manufacturers shortcode. The fonts and design will as always depend on your theme style. It is fully customisable through your theme CSS. Manufacturers listing shows all manufacturers. The manufacturers listing style can be selected in Catalog Design settings. Each manufacturer page contains manufacturer / brand logo, name and assigned products. 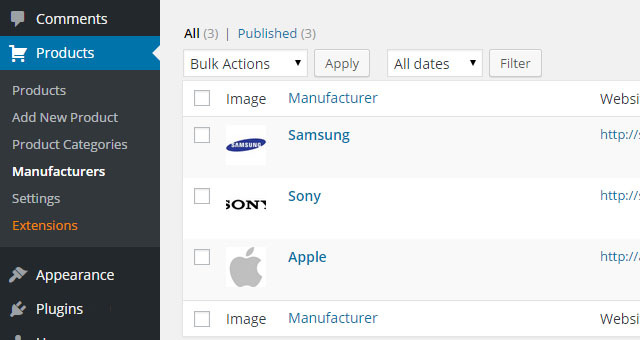 Separate manufacturers sidebar can be enabled for manufacturers pages. 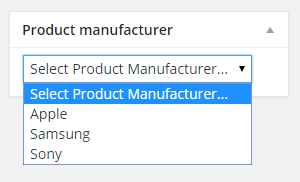 As in eCommerce Product Catalog your can change “Manufacturers” and “Manufacturer” labels to anything else e.g. author, brand.